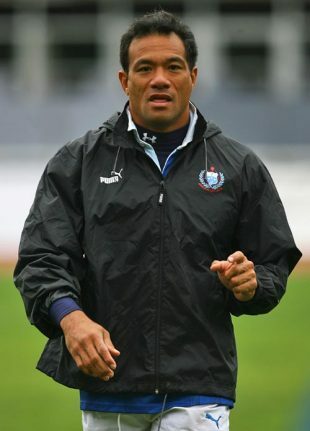 Brian Lima is known to many as the man who has played for Samoa at five Rugby World Cups. He is more fondly remembered by his fans as someone who has given everything in representing his country, and left opposition players reeling with his fearsome tackling ability. "The Chiropractor" was at home on the wing or in the centre, and first appeared in a Samoan jersey on a murky afternoon in Cardiff during the 1991 World Cup. He was the youngest player at the tournament, but was part of a Samoa team that beat Wales 16-13 to announce themselves on the world stage. Lima and Samoa claimed a quarter final place following this famous win, and the shy Lima was catapulted into the world of rugby. He moved from his local St Marist club in Apia to play for Auckland and the Blues in the Super 12. Lima's club career proved to be as varied an action-packed as his international one, as he pulled on the jerseys of the Highlanders, Stade Francais, Swansea and Secom of Japan. Lima signed for Munster in 2004, but injury meant that he left the Irish province having never pulled on the famous jersey. He signed a deal with English Premiership side Bristol in time for the 2005/06 season, meaning that he had experience top-level competition in no fewer than six leagues around the world. Graduating to the world stage was a huge change for Lima, who grew up practising hits on his friends while they played rugby with sticks thanks to the unavailability of balls. In 1995 he was part of another World Cup campaign, again reaching the quarter finals with Samoa after wins over Argentina and Italy. They exited the tournament at the hands of eventual winners South Africa, but Lima returned to fight another day. In the 1999 World Cup the Samoans returned to face Wales in Cardiff, this time at the new Millennium Stadium, and were again victorious with a free flowing 38-31 victory. They found their route to the quarter-final blocked by Scotland however, who defeated them 35-20 in their play-off at Murrayfield. Lima's dreams of a third quarter final were also dashed in 2003, despite spirited performances from the Samoans. Against eventual champions England, the Samoans put up a heroic fight, scoring arguably the try of the tournament through Semo Sititi. Lima's contribution to their heavy loss to South Africa has become a signature moment since the advent of YouTube, when he justified his nickname with a flying hit on Springbok outside half Derek Hougaard. As he aged Lima found himself playing more often at inside centre, a position that allowed his ferocious defence to take centre stage. Lima's final Rugby World Cup came in 2007, but it was far from his finest hour. His record breaking appearance came from the bench against South Africa, but he lasted only three minutes after concussing himself while attempting one of his trademark hits in midfield. His final game in a Samoa shirt came in the 44-22 defeat to England later in that tournament. Following the Samoan's final game at the tournament, a 25-21 win over the USA; Lima led the side in several celebratory Hakas before being carried around the pitch on his team-mates shoulders to rapturous applause. It is typical of the man that following his retirement he returned to his home city of Apia to open a car rental business and raise his three children. While the quiet life now awaits for Lima, his past as the embodiment of the Samoan warrior spirit will not be easily forgotten by rugby fans.